(Anagallis arvensis) Scarlet pimpernel is an annual wildflower that has spreading stems that grow profusely all over the garden at which point it is regarded as a weed. No, not the chivalrous Englishman, Sir Percy Blakeney, in the novel by Baroness Orczy, but the annual wildflower! Scarlet pimpernel produces attractive orange or red summer flowers, but it has spreading stems that grow profusely all over the garden at which point it is regarded as a weed. Scarlet pimpernel also produces lots of seeds that spread it even further all over the garden, making it a nuisance and more of a problem to control. These seeds can remain dormant in the ground for several years. And as “One year’s seeding means seven years weeding”, allowing plants to flower and produce seeds, means several years of trying to control and remove it. Scarlet pimpernel has a low-growing, ground-hugging, creeping habit, but plants can overwinter as a rosette of leaves with upright stems. In spring and summer, stems spread up to 30cm (12in) long making large plants that take over areas of the garden and can smother and damage other low-growing plants. It produces orange to red flowers singly in the leaf axils from spring to autumn. These only open when the sun is shining and begin to close at midday, giving it the common name of shepherd’s clock. 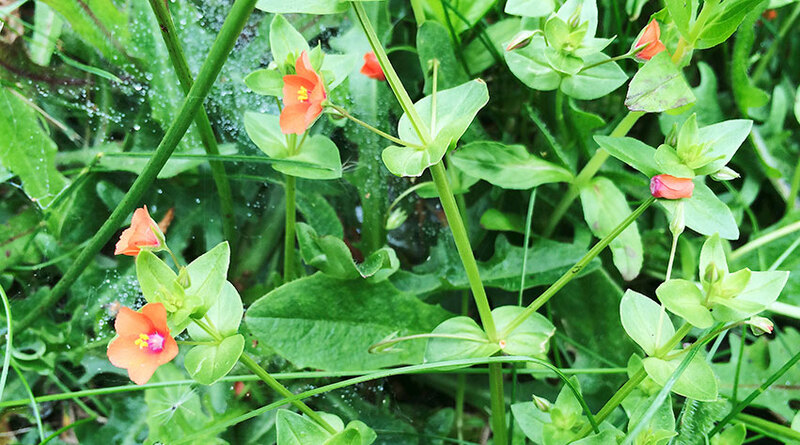 As with most weeds, don’t allow scarlet pimpernel to become established. This will make it more difficult to fully control it. Early identification and eradication is very important. Digging out small plants is a relatively quick – although not necessarily easy – way of getting rid of scarlet pimpernel. A fork and hand fork are usually better tools than a spade and trowel. Digging out larger plants when they are more established is more time consuming and more difficult – especially where they’re growing among wanted plants. Regularly hoeing seedlings and young plants as soon as you see them is the quickest and easiest method of control. The aim of hoeing is to sever the weed stems at or just below ground level, cutting the top growth from its roots. A sharp hoe blade will make this even quicker and easier, so always sharpen the hoe blade before using it. Hoeing on a warm and/or windy day will mean plants quickly dehydrate and die. Flame guns and weeders that use an electric current are also effective in some locations. Covering bare soil with weed-control membrane (landscape fabric) or even thick black polythene will exclude light and prevent seeds germinating. As will mulching the soil with organic matter, such as a bark mulch. For mulches to work properly, they need to be a minimum of 5cm (2in) thick, but 7.5cm (3in) deep works better. In lawns, regular mowing throughout the year and the use of lawn fertilisers and lawn weedkillers should weaken and eventually kill it. You may unknowingly introduce scarlet pimpernel seeds into your garden when buying topsoil or manure. So be vigilant when buying these. There are a number of weed control options available to treat scarlet pimpernel. In addition to traditional weedkillers there are now also a range of more natural alternatives. Any weedkiller can be used to control and kill scarlet pimpernel in beds, borders, waste ground and on paths. Those marketed as “fast acting” are contact weedkillers – killing or damaging the plant tissue they are sprayed onto or make contact with. These tend to be based on “naturally-occurring” active ingredients, such as acetic acid and natural fatty acids. Systemic weedkillers that also kill the roots can also be used. Spray the leaves when the plants are growing actively; this is mainly from March/April to September/October. Contact weedkillers will have some effect if used during the colder weather in winter.